On a dip in gold prices, I have bought gold futures. I bought the June 2013 contract at a price of 1730 at 8:22 this morning. I'll go into my reasoning below. I have been watching gold futures since the early summer, and have been mentioning them frequently in this blog. I have been looking for an entry opportunity on cheap prices, and this was it. I would have preferred to enter on the dip that occurred three weeks ago, but alas, I missed that one. I have been waiting for another good dip since, and it occurred yesterday. 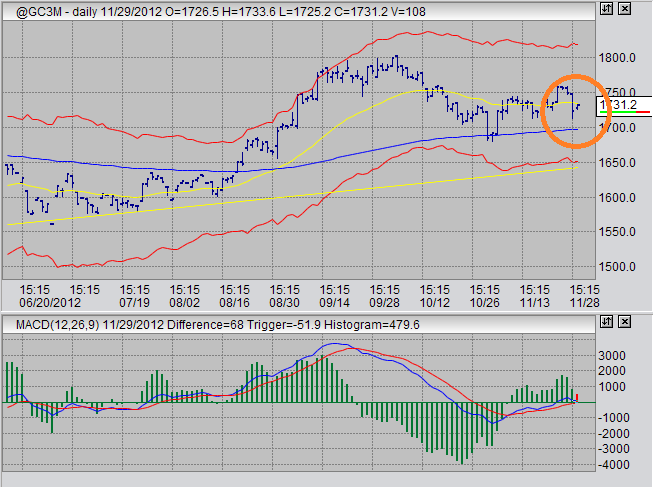 I was actually waiting for an MACD divergence to show itself on the 60 minute chart. I Was looking for it to show itself before this morning on lower overnight prices. This did not occur, and I decided to act anyways. I am quite bullish on gold in the longer term, and although I did not get my preferred entry signal on 60 minute charts, we did still see a solid dip in price. That was enough to warrant my long entry. This is, essentially, a swing trade. Observe the following daily chart for the June futures contract in gold prices. You can see the dip nearly touched on the blue moving average that I have set. It is below the faster yellow moving average. I would have like to see it get a little closer to the blue moving average, and I would have liked to have bought it closer to the bottom. However, I felt that such an opportunity may not occur. I have a set a stop. If prices to regress, I will have the option of exiting and re-entering at a more favorable price. Part of my reasoning to enter this trade even though I didn't get a solid 60 minute signal, was that my bullish sentiment for gold is based on the daily and weekly charts. I was only using 60 minute charts aid me in pinpointing an entry point, and not to determine the overall validity of a trade. In contrast, with natural gas futures I do use 60 minute charts both to pinpoint entry and to determine the existence and validity of a trade. I plan on holding this long gold futures trade a few months. I'm looking to retest the highs with this one. I do believe that we will see new highs over 1900, but I do not know if we will see them within the life of this June 2012 expiry contract. In other markets, I have been watching crude oil, the USDX, sugar, and natural gas all fairly closely. I missed a good natural gas trade that I more or less anticipated. Oh well, coulda shoulda woulda. I'm still bullish on sugar, but I'm having a difficult time satisfying myself that the time is right.